As part of a U.S. Embassy Cairo program supporting the development of artists and cultural organizations in Egypt, the Embassy is pleased to announce the visit to Egypt of Brett Egan, an American expert on Arts Management, from January 4-10, 2014. 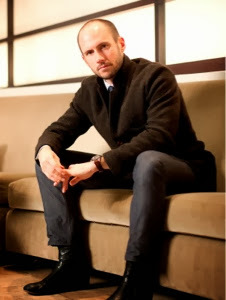 Mr. Egan is the Director of the DeVos Institute of Arts Management at the Kennedy Center in Washington, DC. While in Cairo, he will be conducting training for arts managers and sharing the Institute’s expertise and experiences in arts management with Egyptian arts and cultural organizations. He will also meet with leaders in the arts sector in Cairo in order to learn about the current arts programming environment in Egypt. As one of the largest, busiest performing arts centers in the world, the Kennedy Center and its leadership have developed extensive expertise in strategic planning, artistic planning, board management, marketing, fundraising, and financial management. The DeVos Institute operates on the premise that too few resources are spent to train the managers and boards who keep artists at work. The DeVos Institute has worked with many Egyptian organizations in the past and has a growing professional network of Egyptian arts managers who have received training through its arts management fellowship program. Dr. Mohamed Ibrahim announced today the discovery of King Sobekhotep (1786-1763) who is probably the first King of the 13th Dynasty. 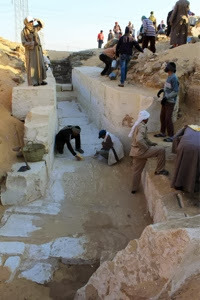 The tomb discovered by Pennsylvania University mission working south of Abydos, Sohag. 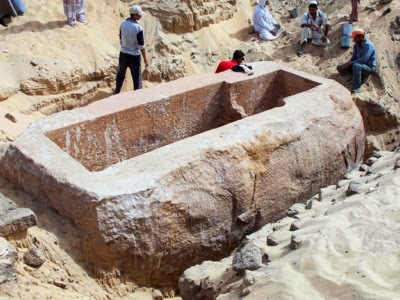 The Minister said that the first lead to this discovery was when the huge quartzite sarcophagi of 60 tons was found in 2013 then last week, parts of tablet was found depicting the name of the King and shows him sitting on his throne. Also parts of canopic jars and funerary objects were found. The Minister also emphasised on the tight security around the tomb till excavations are finished and the tomb restored to be open to public as a part of the ministry efforts to open new sites to encourage tourists to come to Egypt. Dr. Ali Al Asfar, head of the ancient Egyptian department referred that that discovered tomb designed to a pyramid shape and it is similar to the pyramid if Ameny-Qemau (one of the Kings in the beginning if the 13th Dynasty)in Dahshur near Memphis. 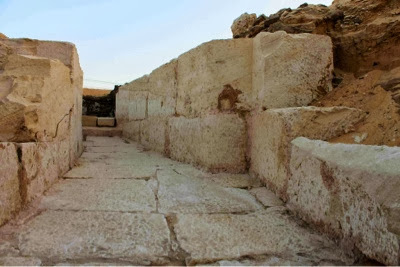 He also added the the tomb structure inside used large stone blocks brought from Tora quarries. As for the burial chamber, it is build of red quartzite which was brought from Gebel Ahmar near Cairo. 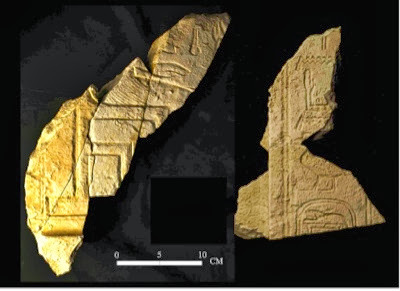 Ayman El Damarany, the inspector working with the mission said "This discovery is an important one as only few monuments or mention of the tomb owners was found before including referring to his name in Abydos and also he was mentioned in the Turin Papyri as ruler for 4 and half years. This period is considered the longest in that era which makes this discovery even more important to get to know more details about his life and reign. Dr. Josef W. Wegner, the mission director said that excavations still ongoing as more studies needed in the search for more daily life details of this era in the ancient Egyptian history which lack many of archaeological information.